For those of you who do not already know, I am very picky about the power metal bands that I like. Granted, most of the power metal bands I like can be considered the genre's stalwarts, but it's amazing how few and far between those bands are - and none of them are bands that I would consider my favorites. However, there are very many power metal bands that are vying for the attention of what I consider to be a fairly narrow base of fans. Most of the power metal bands that I review for Rough Edge get my attention for the couple of spins that it takes to get a handle on what separates them from the other power metal bands ... or doesn't. And then they are usually never listened to again. Eyes Of Shiva are a Brazilian power metal band that doesn't focus 100% on speed or relentless overdriven guitar crunch. 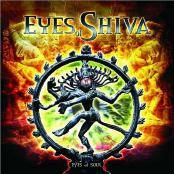 Eyes Of Shiva are one of the more melody driven power metal bands I've ever heard. Eyes Of Shiva also aren't afraid to use their familiarity of Latin music to be an interesting facet of their music; the inclusion of Latin music truly separates them from their predecessors and their peers in the power metal genre. Additionally, although not truly progressive like Dream Theater, Eyes Of Shiva include a fair amount of heavy riffing in their songs. Generally, "Eyes Of Soul" has a more 'rock'n'roll' feel than most power metal records – and I like that. While listening to Eyes Of Shiva's "Eyes Of Soul" I was busily distracted with numerous other tasks I needed to tend to. Consequently "Eyes Of Soul" served more as a backdrop for my tasks. However, certain sections of the band's songs caught my attention and I realized that Eyes Of Shiva have some potential that hasn't yet been fully realized. Songwriting may eventually be Eyes Of Shiva's strong suit and I encourage them to continue to develop this facet of their careers. Eyes Of Soul covers Heart's "Alone" and although this track is not particular indicative of their style their choice of this song should give you an idea of their focus on melody as Heart were one of the few bands in the '80s that managed to successfully merge 'heaviness' (relatively speaking) and melody into a cohesive, accessible whole. For a debut, "Eyes Of Soul" is fairly accomplished from a technical standing and very well produced. Eyes Of Shiva have a lot of promise based on their performance on "Eyes Of Soul." Power metal fans would be wise to keep an eye on Eyes Of Shiva. "Eyes Of Soul" was produced by Fabio Laguna (Angra) & Eyes Of Shiva. The disc was mixed and mastered by Dennis Ward (Pink Cream 69). Eyes Of Shiva: Andre Ferrari on vocals, Ricardo Gil on guitars, Renato Mendes on guitars, Gustavo Boni on bass, and Ricardo Longhi on drums. I hear a lot of keyboards on "Eyes Of Soul" but no keyboardist is credited in the promotional materials I found on the band's website. For more information visit http://www.eyesofshiva.com.